MOLLY FEESLER '82 (ATHLETE / COACH), JOHN KELLEY '97 (WRESTLING / FOOTBALL), CARL LINKE '66 (FOOTBALL), JODIE STRANGES '94 (SOCCER), AND GUIDO RICEVUTO (COACH). In 2014, the St. Francis DeSales Athletic Hall of Fame was founded to honor, pay tribute and perpetuate the memory of those individuals who, through participation, have made outstanding contributions in the field of athletics and who have helped bring recognition, honor, distinction and excellence to St. Francis DeSales High School. 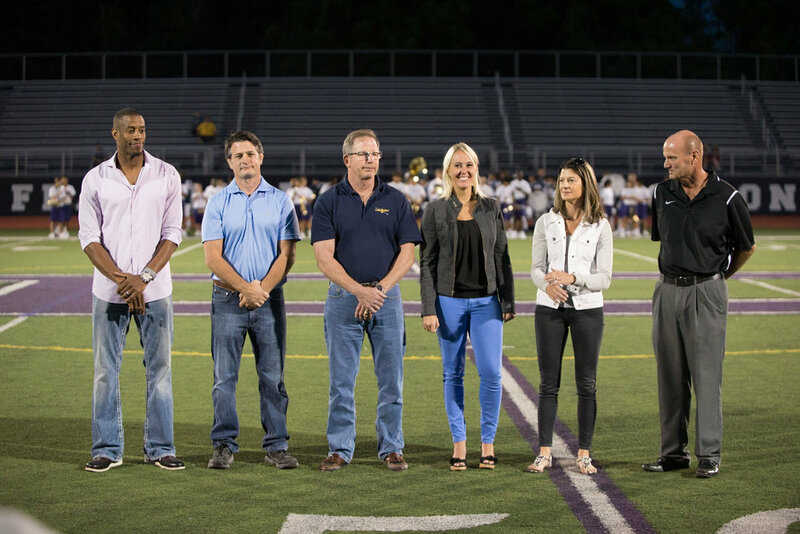 St. Francis DeSales Athletic Hall of Fame recipients are chosen by a committee, who will base their selections on a level of excellence in a particular sport (e.g. captain, team MVP, All-district, All-Ohio, etc. ), especially as it relates to other teammates and the level of competition during the candidate's era. Consideration is also given to candidates who participated in multiple sports during their careers, even if their level of success varied in those sports. Finally, the committee attempts to select candidates that result in a class of inductees that appropriately represent the broad range of sports at St. Francis DeSales High School. The criteria for selection is listed below. If you would like to nominate a past athlete or coach for the SFD Athletic Hall of Fame, please submit your nomination online by clicking on the link below. The 2017 inductees were (pictured above L to R) Antonio Daniels (basketball), Mark Marinelli (wrestling / coach), Tom Bauer (wrestling), Chelsea Baker (softball), Stacie Rose (basketball, soccer, track) and Phil Callaghan (baseball / coach). The 2016 inductees were (pictured above L to R) Tesia Kozlowski (soccer), Carri Volpe, (basketball, softball, volleyball), Jeanne Lennon sister of Bob Lennon (coach), and Matt Stewart (football) and Domenic Romanelli (soccer). The 2015 inductees were (pictured above L to R) Bob Jacoby (coach), Bob Kristoff, (football, wrestling), Lori Fisher (basketball, volleyball), Andy Kessinger (cross country, soccer) and Drew Durbin (gymnastics). Not pictured: Tony Pusateri (coach). For more on the class of 2015 click here. The 2014 inductees were Luke Fickell (football, wrestling), Mindy Hammond (basketball, soccer) Lisa Regrut (basketball, softball, volleyball), Forest “Treeze” Sharrock (coach), Bob Triano (coach), Anne Weilbacher (swimming), Kathy Wiemels (coach), Blaine Wilson (gymnastics) and Mark Zimmer (wrestling). For more on the class of 2014 click here.